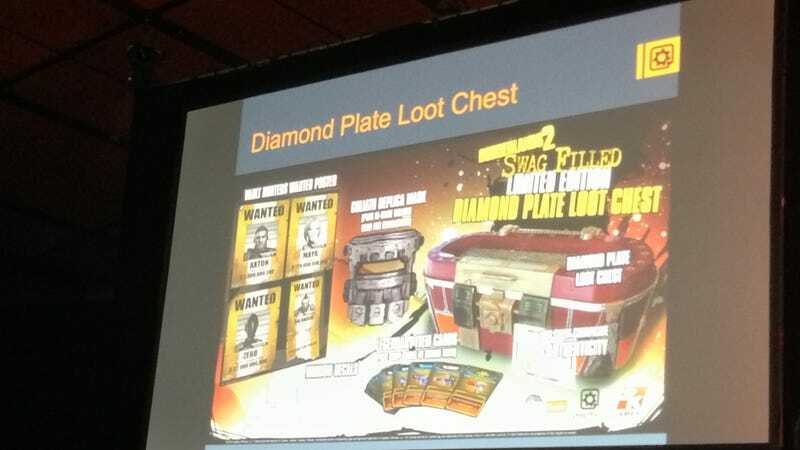 Gearbox's last Borderlands 2 loot chests were such a hit, they decided to make a new version to match the style (aka diamond plated) of the in-game chests in the sequel. It's a collaboration with Think Geek, and they're only releasing 5,000 of them. The chests will be stocked with new content, including redeemable in-game legendary weapons or items that will scale to your character's specific level. It also comes with a Goliath mask that you—your real, fleshy self—can wear, as well as a Shift code (found on the back of your mask) to redeem a customizable Goliath head for your in-game self. There's some art in there, too: wanted posters for each of the original vault hunters. It'll be available in May for $99.99 on Think Geek's site, or ShopGearbox.com (for international folks, you can pick one up at forbiddenplanet.co.uk).